An all-in-one tool to convert all videos, decypt/copy/rip Blu-ray and DVD with high quality. The converter supports importing Blu-Ray, DVD as well as various videos. I just choose BD/DVD folder to load the entire movie. There are many options cataloged with different output usage such as HD Video, iPad, Apple TV and PSP in output format settings. I choose AVI HD option from the common video category to get the high quality video for storing in Netgear Stora and share it with my family. Click the Convert button on the bottom-right corner of the application and then a list of the videos for conversion will be listed. Then you can directly copy output AVI HD files to Netgear Stora. 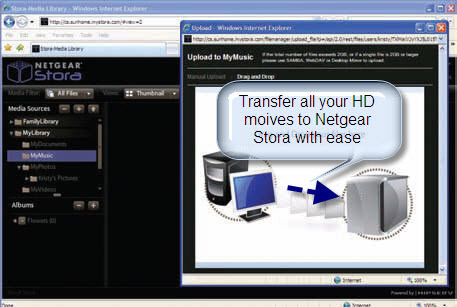 Now, you can enjoy your favorite Blu-Ray movies from your Netgear Stora media library from anywhere with an Internet connection. NETGEAR Stora, which is a DLNA certified home media network storage, lets you store, share and protect music, movies, photos and data using any device on your home network and over the Internet. Listen to your music collection while traveling. Share a private photo album with family and friends. Drop photos into Facebook with ease. Automate backup from the PCs and Macs in your home to eliminate data loss worries. NETGEAR Stora even supports a second hard drive that mirrors the first, on the fly, ensuring even greater reliability for those irreplaceable digital assets. Unleash the power of your home network with Stora. The using interface is ok, clear and very easy to follow. I use to encode mainly with h264 codec in MKV and mp4 enclosures and it works very well. Aunsoft supports for different audio language tracks of my Blu-rays, that's very important; a plus for your software that it is difficult to find in competitive products. The speed and quality are superior to other programs out there. After conversion, I burnt a DVD and played back on my TV and it produced very high quality.